The ultimate touring model is infused with the unique custom style of master customizer Cory Ness in this limited-edition model. It’s as if Cory turned over his personal custom bike loaded with Ness custom accessories, his personal paint and graphics, a smooth suede seat and the ride and performance Cory demands on the open road. This exclusive, limited-edition model has a numbered metal badge on the case that includes graphics of the Cory Ness logo and signature. The perfect complement to Cory Ness style is genuine Victory performance. The smooth and powerful 106-cubic inch Freedom® V-Twin serves up 106 ft-lb of torque, and the 6-speed transmission has true overdrive for the smoothest highway cruising. Plus, the cylinders are diamond-cut for the ultimate custom treatment. The Freedom® engine gets the ultimate custom treatment as the exterior surfaces of the cylinders and heads are diamond cut for a great look. You’ll swear this bike came out of a custom shop, not off the assembly line in Spirit Lake. Cory knows how to combine comfort and a custom look. The custom seat is covered with a premium suede, and it has individual heating controls for the passenger and driver. 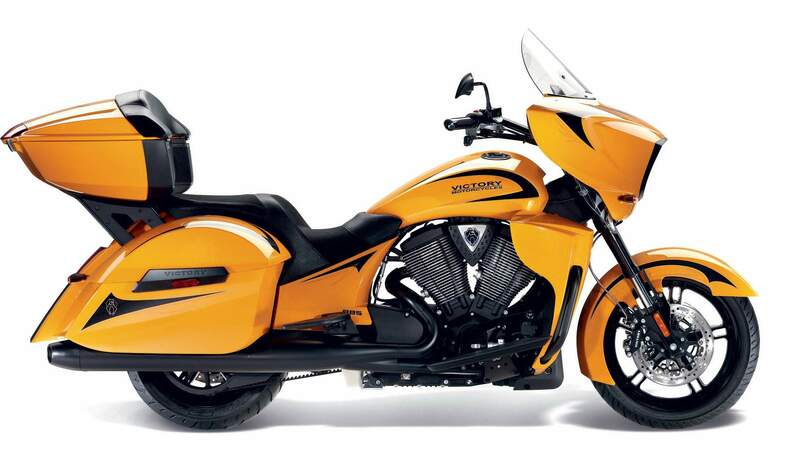 With the exclusive Victory Comfort Control System, riders can manage the airflow reaching the riders. They can enjoy cooling airflow in warm weather, or ride with full protection when it’s cold or rainy. This bike has the most cargo space of any motorcycle in the world – 41.1 gallons combined among the saddlebags, Lock & Ride® Trunk and two convenient storage pods in easy reach of the driver. Customize the ergonomics for the passenger by adjusting the floorboards to any of the three available heights over a range of 2”. They can also be set at a 10° angle if that’s what the passenger prefers. With Victory-exclusive Lock & Ride® technology, you can install or remove this trunk quickly and easily – without tools. It locks onto the saddlebag brackets in seconds. The trunk has ample room for cargo, a power outlet, audio speakers and a passenger backrest. Take the party on the road. Premium KICKER® speakers in the fairing and the front face of the trunk deliver powerful, top-quality audio. The audio volume automatically increases as bike speed increases, and vice versa. Three convenient power outlets let riders charge small electronics or power accessories. Use the iPod® cord in the storage pod by the driver’s left leg to use your personal music source for the bike’s audio system.